My last informant hadn’t lied; the village of Aldëgobi is worth the detour. Protected behind a high wooden palisade, the small hamlet was built around a mound of earth. The small community that lives in this enclosure is peaceful. They worship Kaouck, a divinity that was unknown to me until today. Kaouck would be the god of life, benevolence, and happiness. I was lucky enough to attend one of their amazing ceremonies. The villagers built a strange monument, a sphere of red crystal set atop a pyramid of stone. The whole rests on a large round slab surrounded by seven triangular columns. The ritual dances were magnificent. Their aim was to demand the help of the great Kaouck, because a strange infection affects the inhabitants of the village. The disease began with the animals and now it’s touch can spread to men. It causes a violent eruption of purulent pimples, and a high fever. An old lady was anxious to show me her young son affected by this infection. I have, as usual, found a good excuse not to accompany her and I took the opportunity to quickly leave this contaminated village. The most important thing a map like this needs is some sort of a scale, Such as (I______I=50 ft.). I guess we can assume the top of the map is North. The size of the settlement should be considered a town. Rather then a hamlet or a village. For defensive purposes, the trees are far to close. Besides, the initial building of the palisade and the structures in the town would of used the closest trees, which size that is shown. Would be 10 x as big as any normal sized ones One should also consider how much firewood a place like that would use on a daily basis. It is a general rule of thumb that any society will use the closest resources to where it is at. first. Unless they are fruit or edible nut bearing trees. Which anyone with any forethought would spare for the future harvest they would provide. The small # field could no way provide enough food for those who lived in the town. Neither is no fields for the grazing of livestock. Nor is there any sign of there being any wells or any other source of water. Don’t feel bad. Much the same can be said for most Fantasy Settlement Maps. 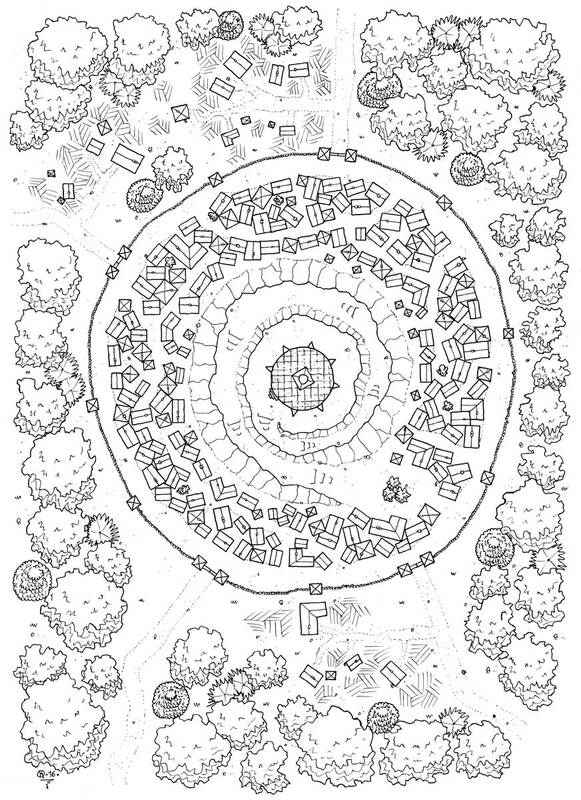 I guess most fantasy map makers have not studied how actual real world settlements were established and the infrastructure such a place would need to have, to function properly. Hey, hi and thank you for your comment. But don’t get me wrong, I know all about this. But I think you’re the one who’s forgetting something: Fantasy. Under no circumstances do I intend to draw maps that could look like what we find on earth or that we could create with our references. Just for fun, you talk to me about firewood, I tell you it’s hot as hell on this planet, and that the inhabitants are very happy to have alchemist wizards to create gigantic blocks of ice to help them stay cool (moreover, the water from the melting of these blocks could very well serve as drinking water) and this is only one example that came out of my crazy brain in less than 30 seconds, I am sure I could find lots of others, and even some that would respect our human “reference”. And this could be appli to all your remarks. If you are looking for realistic maps according to the conventions of our human civilization, look at the historical maps. I think it will meet your expectations more than fantastic maps. I would be delighted to discuss about this with you if you want.